I think 2012 is officially starting off with a big organization boom!! So many bloggers are posting about purging junk and cleaning out closets. What's your biggest problem area right now?? I have to admit that I'm kind of OCD about keeping things junk-free. Well, as OCD as one can be living with two boys in the house. And a dog. And two cats. So it's all relative, right? 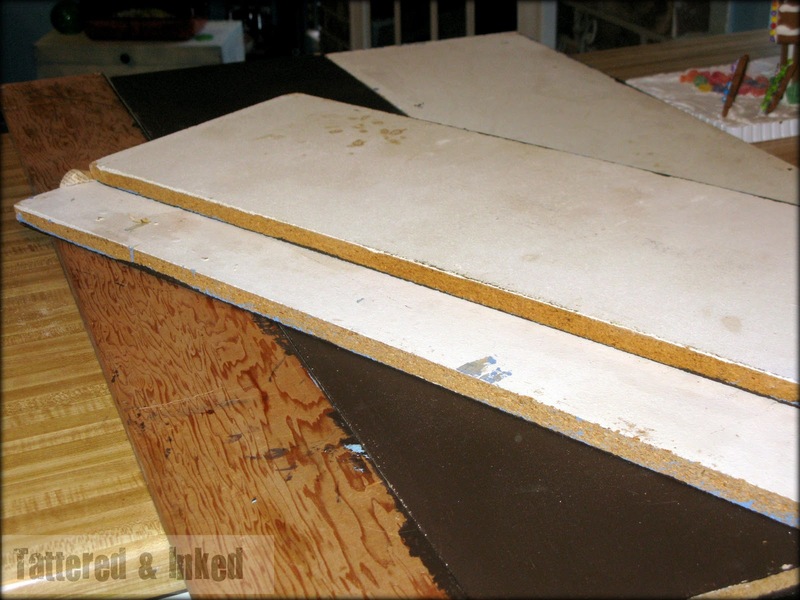 I try to purge things out on a weekly basis but things just pile up. One of the spaces in my house that has been bugging me for a while is our pantry. Well that was all fine and dandy to look at as long as you didn't open the doors. Pretty harlequin pattern on the outside. And as you saw with my laundry closet redo, our house doesn't give us much in terms of space. So our pantry is pretty much the only space we have to store food. We have a couple cabinets that store all the baking necessities but all our other cabinets are hard at work storing everyday kitchen supplies. So our pantry gets stuffed. I guess we just need to get to it. So it's not the worst thing ever. It just needs a little help. First things first, the shelves were in sad, sad shape. We painted them when we first moved in with the same chocolate brown from our bedroom and didn't seal them with anything. So they were scratched to bits. 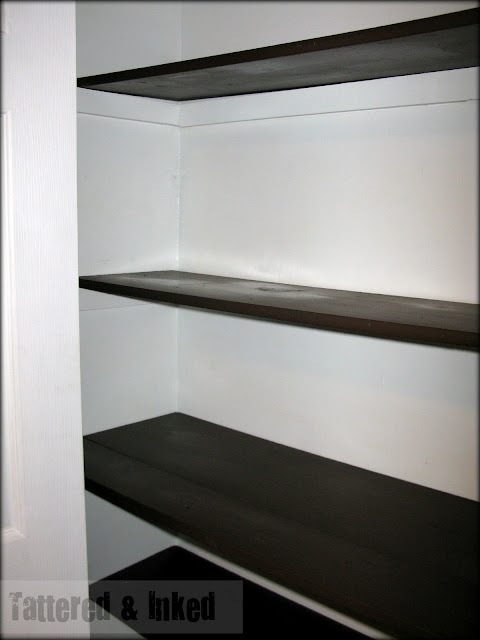 I still like the chocolate brown against the walls so I pulled all the shelves out to repaint and seal them. ...and decided that they were more of an 'off-white' now a days than anything. So I got some white high-gloss paint and put a quick coat on the walls. I decided to go ahead and paint the under-side of them as well since it always drove me crazy to lean down and see that ugliness. Because I just painted them in my kitchen. 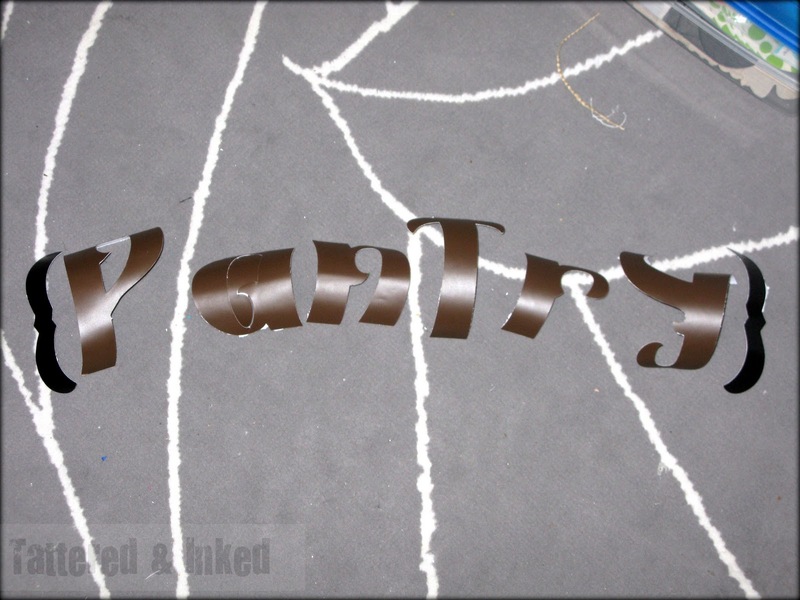 Once the several coats of brown had dried, I layered on some spray lacquer. It has a pretty gloss to it and is super durable. Though the smell could probably kill you if you don't watch out! So here are my pretty brown shelves (and now white walls) drying. It's amazing what just a fresh coat of paint can do! While all that dried, I decided I had to add some cute-ness to it. C'mon guys, you knew that was coming. I cut the word 'pantry' from brown vinyl but ran out when it came to adding some brackets to the end. I love the punch of personality it adds. I had to put it pretty close to the top because the top shelf holds cereal and they would cover all the prettiness up! And of course, I have to include a shot with my blue walls! I'm glad I painted those shelves brown two years ago- I think they're the perfect color to add in there. See that yellow shelf in there? Totally a locker shelf from middle school. It was a birght crazy green so I made it yellow too. Because everyone loves labels right? And it only takes four quick steps!! 1. Create labels on an editing program (I used My Memories Suite!) and print out. 2. Find some chipboard shapes to use as backing. Or you could use cardboard too. 3. 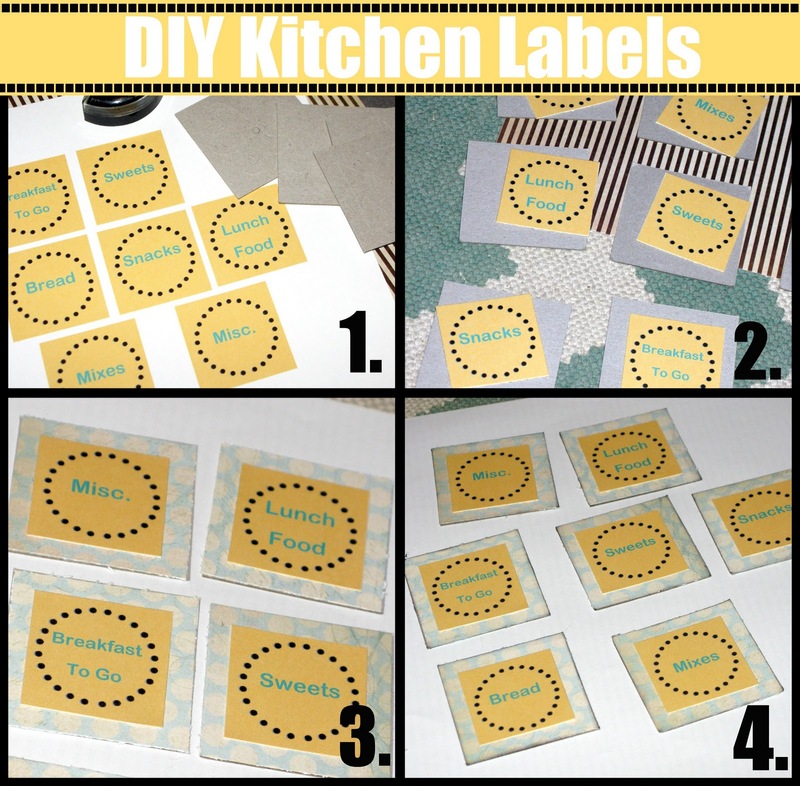 Cut and adhere scrapbook paper onto the shape and then adhere your label. I used some sticky squares to put them on. 4. Ink the edges to help them pop a little when they're on the containers. 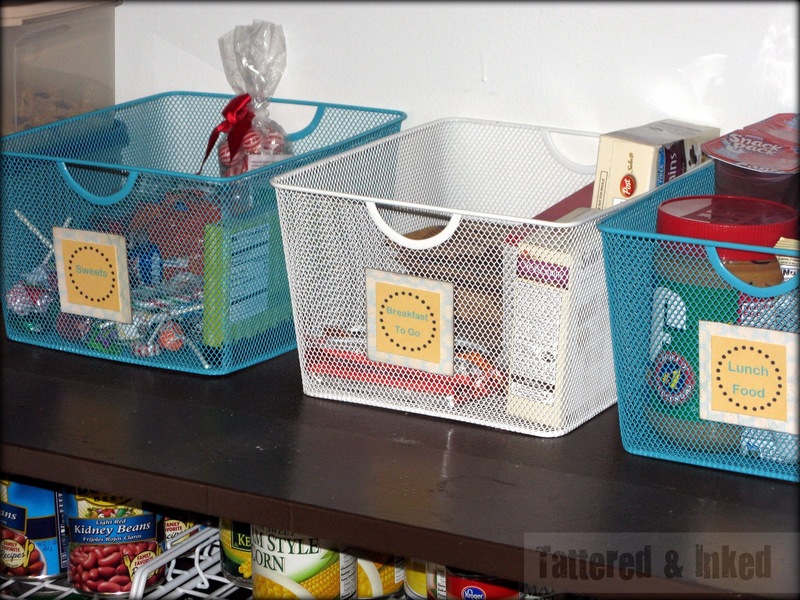 I used my hot glue gun to attach them to my baskets in the pantry. 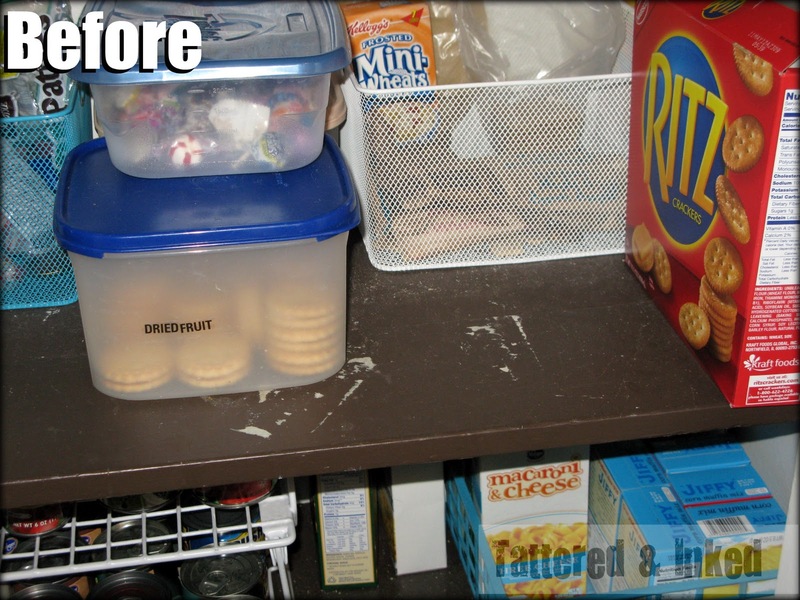 I sorted all my food first though just to make sure I knew what was going in each container. I had all the bins on hand from places like the Dollar store and Target's Dollar Spot. I love that I found my blue and white! a very full but very organized Pantry for 2012!!! 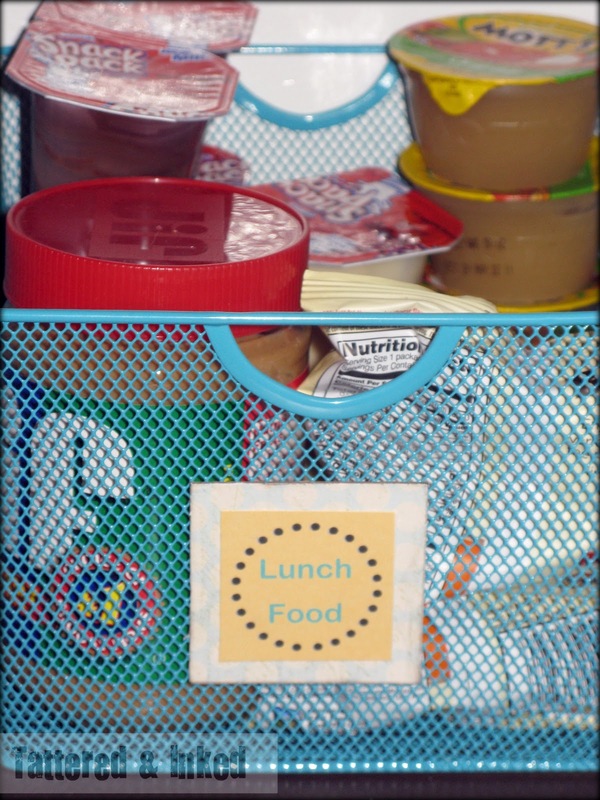 My favorite part is having everything I need for little man's lunches in one place. It's always a scavenger hunt to piece his lunches together but now they're all corraled together for easy packing! So you know my whole theory that if I prettied up my laundry closet that I might actually want to do laundry? Well maybe that theory didn't work out so well. Though I still love looking at my laundry closet. 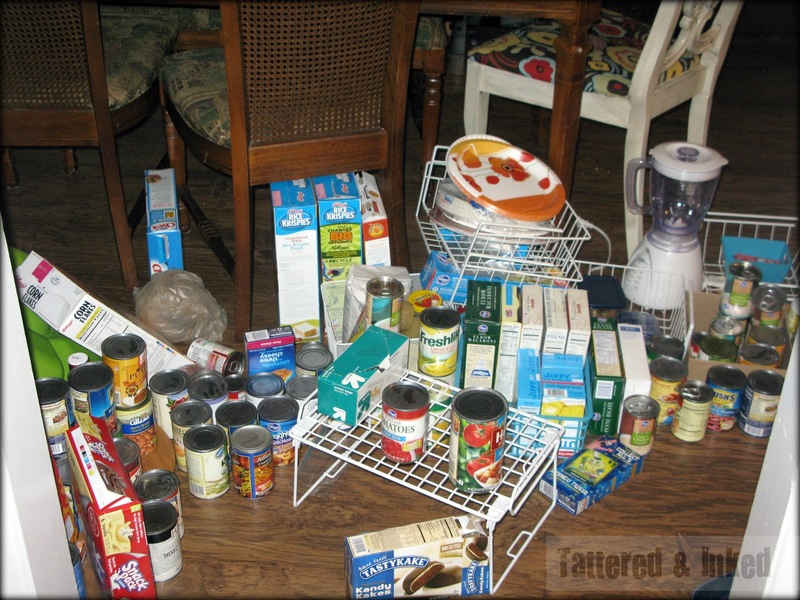 Maybe the theory will pan out for putting groceries away. What spaces are on your list to tackle in your house?? I LOVE being organized. 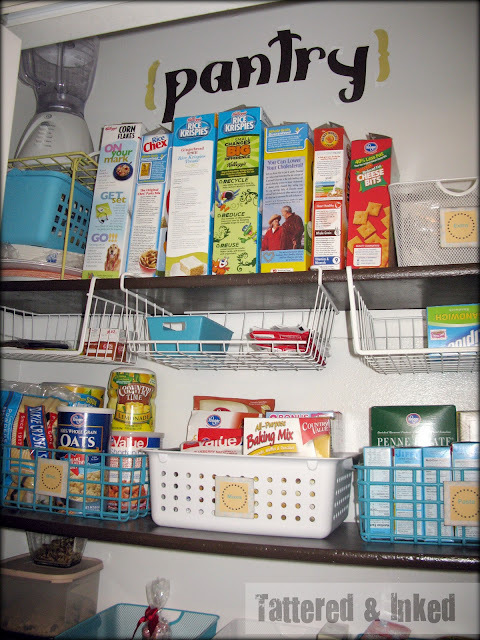 I totally need to organize and label my pantry. thanks for the kick in the pants! How fun! 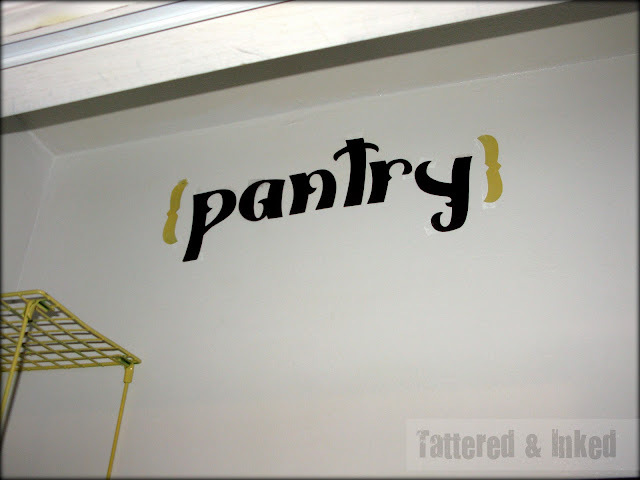 I worked on my pantry today too. I also didn't know that vinyl was spray paintable so that's an exciting tip. 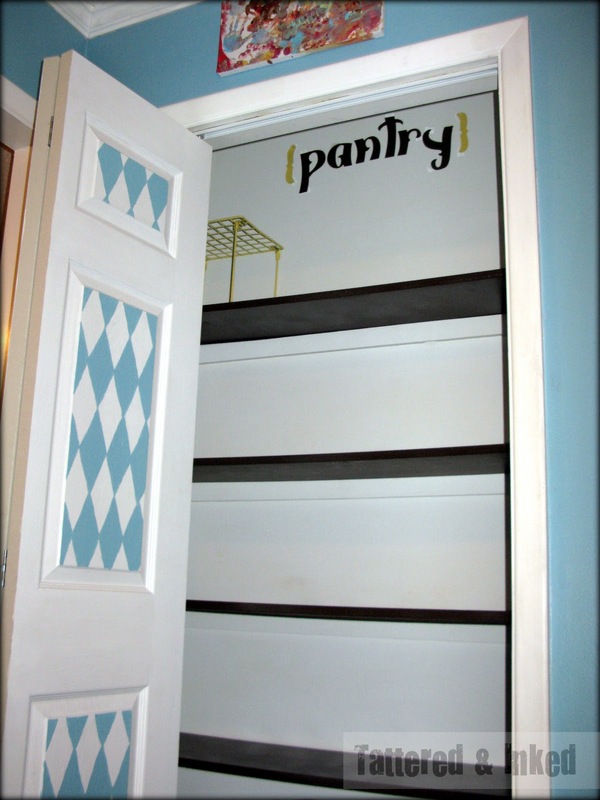 Also, what did you use on the doors of your pantry with the pattern? Thanks! It's one of the most realistic pantry makeovers I've seen :) Now, I need to get some baskets, and get to work! I LOVE your wine cabinet. I must work on my pantry tomorrow. Nice job! 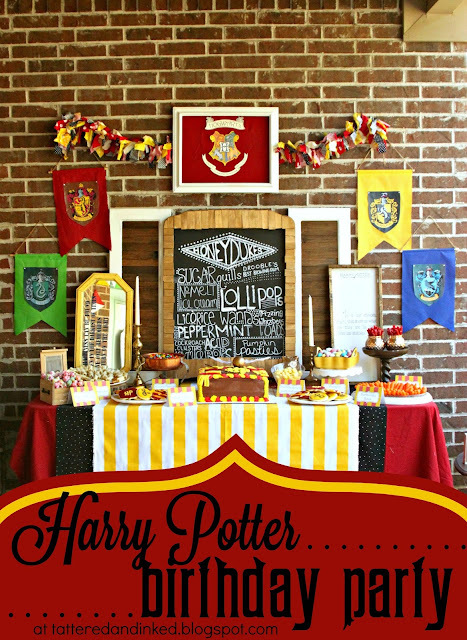 I'd love to have you link this up to my party at http://scrapbookingez.blogspot.com/2012/01/anything-goes-linky-party.html. Thanks for sharing! 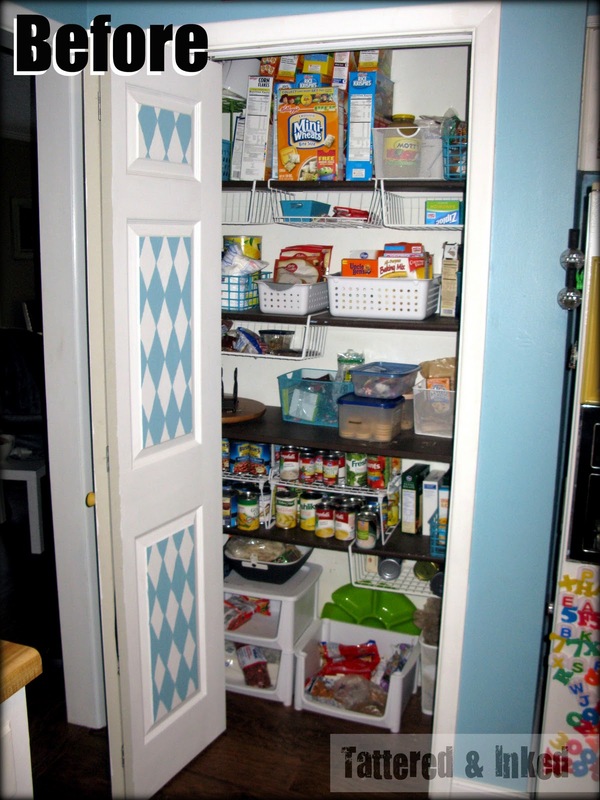 This is so great...to see another person attacking their pantry! 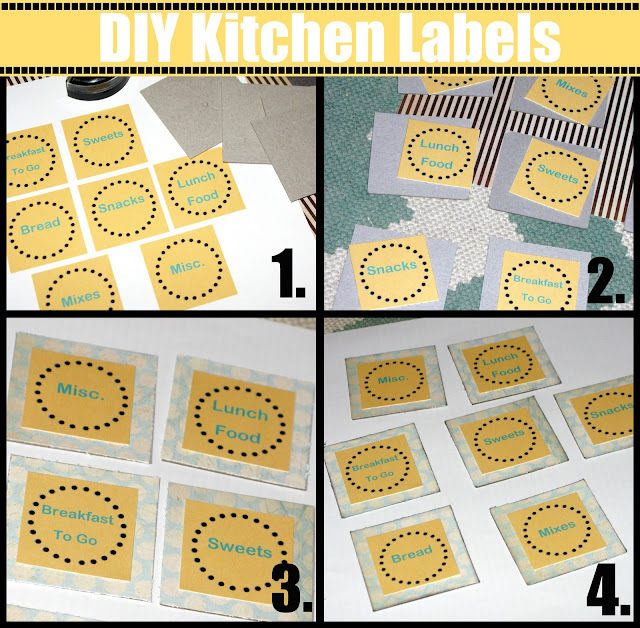 I am waiting on my chalkboard contact paper to come so I can label ours. 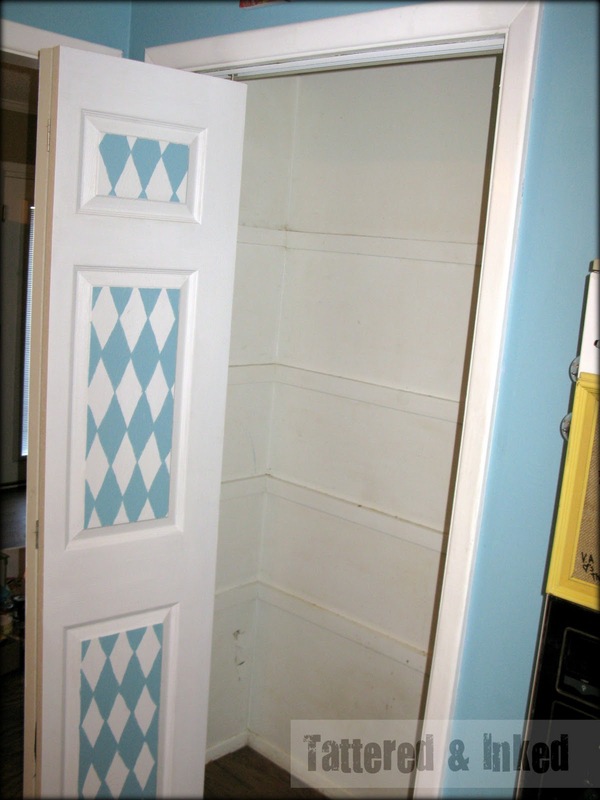 Then, I'm moving on to the linen and coat closets. This is great! This looks great!! It is very motivating!! 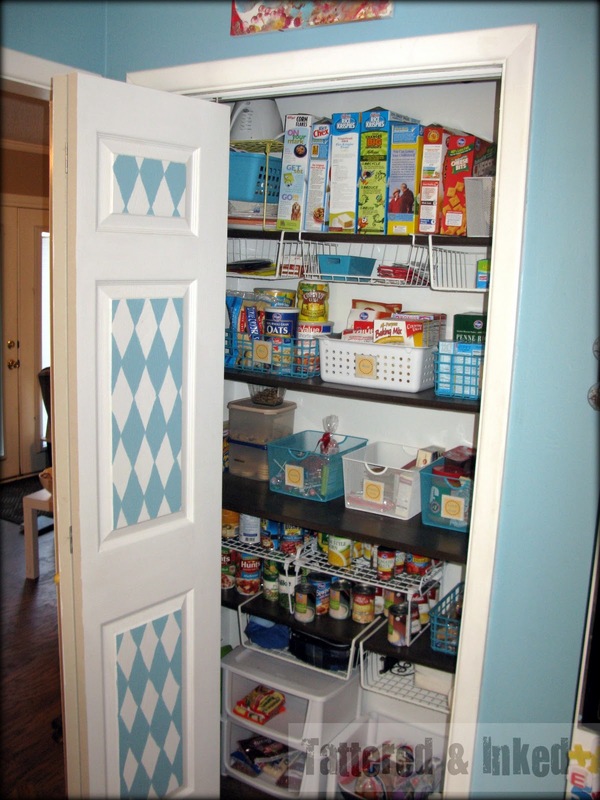 I am so surprised to see your pantry. Because of there are lots of things in it. According to me you must fill up limited item things which you have need on daily basis. It looks great. I love all your fun labels! Where did you get the white shelves that hang from your brown shelves? I really need some of those!! An Array of Projects and Playing Catch Up!